I’m not going to write a long entry about it, but I am the proud owner of a brand new Wii. Suffice to say, it’s very fun, especially the Tennis game in Wii Sports. I ended up camping out at Best Buy starting at 6PM on saturday. If I wanted I probably could have shown up around 4 AM or so and still gotten a unit, but I figured if I was going to camp, I’d do it right. I hung out with a group of guys from WPI (guys I hadn’t met before), and it was a lot of fun. Unfortunately, it was also freezing cold. From about 2AM to 5AM everybody was huddled under blankets trying to stay warm. Some people actually managed to sleep, but I didn’t. Still, I think it was worth it. 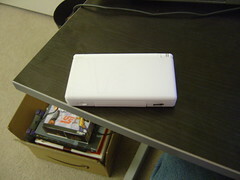 The DS Lite was released today, and I picked up my pre-order. I have yet to actually play with it yet (had to wait for it to charge), but it’s finally ready. I took some pictures of it first, though. So Nintendo has finally released information about the controller for their new Revolution system. And the controller sure is different. It looks more like a TV remote with the ability to attach various peripherals (like an analog stick) to it. It’s also wireless, has rumble, and the system can detect where the remote is pointed (at the screen), movement of the remote (including forward and back), and twisting of the remote. I can just imagine how an FPS will be on this system. This is going to make for some very interesting games, and will definitely make the Revolution not a competitor to PS3 and XBox360 but rather a separate must-have platform. So if you haven’t seen it yet, go read the article on IGN.